Overlevelseseventyret The Solus Project har fått tidliglansering. I The Solus Project spiller du en astronaut som har blitt sendt til en fjern planet for å finne ut hvordan du kan redde menneskeheten. Denne planeten skjuler en mengde farer, både av naturlig og unaturlig art, og utviklerne skriver at din største fiende vil være miljøene selv. Blant annet skilter spillet med et avansert klimasystem, der temperaturen og været endres dynamisk. Spillet har vært under utvikling i cirka to og et halvt år, og har nå fått en tidliglansering på Steams «early access»-tjeneste og GOGs tilsvarende «in development»-tjeneste. Meningen er ikke at dette spillet skal være i «early access» i evigheter – planen er å slippe den ferdige versjonen om rundt 90 dager. Hele spillet er ferdigutviklet, men vil lanseres trinnvis i tidligperioden. All updates and new episodes will be free and automatically apply. The game does not take a pay-per-episode approach. Release 1: The first three levels of the game. Worth about 1-2 hours worth of game, with lots of hidden secrets to figure out while waiting for the next release. Release 2: +Levels 4, 5 and 6. Adding another 2 hours of gameplay. And any content from previous releases of course. Release 3: +Levels 7 and 8, adding another 2 hours. Release 4: +Level 9. Adding another 1 hour. Release 5: Not 100% sure we’d do a fifth release, but if we’d do then that would be level 10. If not level 10 and 11 + the end game sequence will be held off until the full release. Is fully optimized. Performance is close to final. Has fully functional menus, options menus, saving/loading and so forth. Has final art content, it looks as it is meant to look. Localization will happen during EA thus some language support will be missing. Will have some bugs and issues left and right. Save game compatibility and stability cannot be guaranteed but will try as good as we can to keep it compatible. In general is fully playable and featured, but simply doesn’t has all level content and has some bugs/balancing issues left and right. Was tested only with Oculus DK2, but the consumer Oculus and Vive are supported (but again never actually tried). Is pretty performance heavy and you likely won’t hit the target framerate. We are at 60-70 FPS on a Geforce 780 Ti in indoor levels with low quality settings. VR is an experimental feature in general and our focus will be on finishing the game itself. VR support might not mature entirely and might remain experimental. 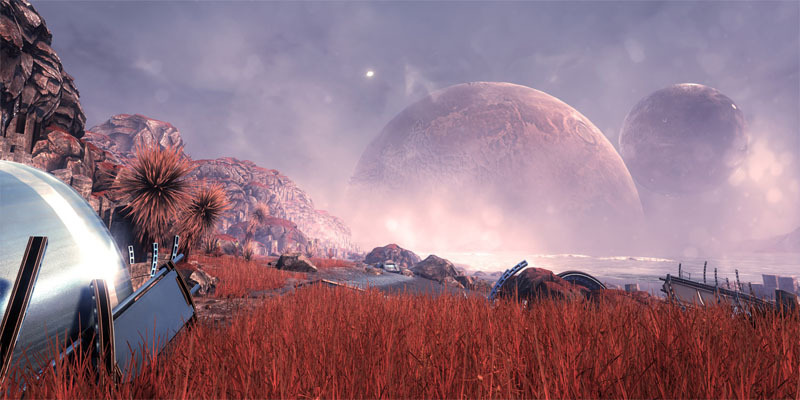 The Solus Project kommer forøvrig også til Xbox One. Har du prøvd retro-rollespillet The Quest?